Programmers are no strangers to strict requirements on form and syntax, so working in the poetic medium of the Haiku comes almost naturally. The brevity and compactness of the haiku lends itself well to writing something tighly focused. I find them quite enjoyable to write. Of course, there are quite a few other poetic structures of note which can offer a fun challenge. The limerick and the sonnet are two of my favorites. Here's a limerick I wrote (beware, obscure programming reference ahead). There once was a coder named Chuck. And through all the source code he snuck. he programmed by punching a duck! A sonnet would be a bit ambitious for this late hour. So unleash your creativity, let's see what you've got. Vanessa prepared a wonderful meal for me this Valentines day. Four courses, the first one pictured here, all delicious. 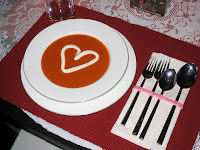 This was the roasted red pepper tomato soup with an artistic heart made of sour cream. And this was only the first course. Have I mentioned that the meal was delicious. I'm very thankful, I married quite a cook. Not only that but she decorated too. It would seem I borrowed a page from one of Ben's blogs and wrote about food. What can I say, a meal like this makes an impression. One of the great things about working in computer science is that you never stop leaning. It seems that many programmer follow a progression from one popular language to the next, and I thought I'd dedicate a post to reminisce about my journey so far. I first learned to program in C. This was at the age of sometime around eleven or thirteen. I was instantly hooked, and since then, I've kept right on learning. I think the path I've taken has been fairly typical. From C, I learned C++ (starting in high school). I learned Java during a summer internship after my junior year of high school. In college, it was more C++, Java, and C (I really learned the ins and outs of C in my networking class) along with some other programming languages. My favorite two classes in my college computer science curriculum were the ones in which I learned assembly language and designed an arithmetic logic unit and then a simple processor. I finally felt like I understood exactly how computers worked. With assembly language I learned a bit about machine code, how many clock cycles specific operations take, and it felt so good to optimize a bit of code to run blazingly fast. In circuit design I learned where those clock cycles come from, why operations take the time they do, and how those machine language op codes are determined. In all things software, at some point it all comes back to electronics. College was also a time to get a taste of other, less widely used, but none-the-less important languages. Scheme and Prolog were particularly interesting to me, but I haven't had much occasion to use them very much recently. So there you have it, a small glimpse into my journey thus far. How does it jive or differ from your own? I recently downloaded the second beta of Firefox 3 from Portable Apps. I didn't want to replace the version of Firefox I already had installed, so I used the version from Portable Apps which runs as a standalone binary. Sometimes it's really nice to unpack a program without touching the registry or worrying about installing.